Eye cream with extract from jellyfish. 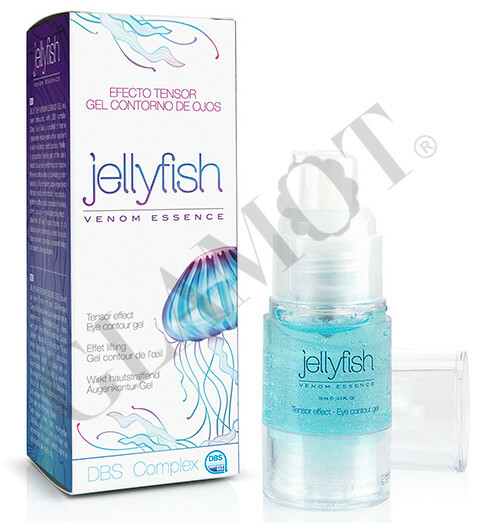 JELLYFISH VENOM ESSENCE cremigel has been formulated with DBS complex (Deep Blue Sea), a cocktail of marine ingredients whose main active Ingredient is Jellyfish Extract; a rich source of fibrillin; a glycoprotein that is a part of the skin’s elastic tissue and which helps to improves the eye contour area by providing greater elasticity. The remaining active ingredients stimulate cell communication and cause a tightening effect and a decreasze in fine lines, crow’s feet and wrinkles (plumping effect). Apply by gently massaging the eye contour area with circular strokes.